The story of Midnight Apple begins with the passion and commitment to compose original music in an age defined by commerce and niche markets and draws inspiration from classic blues and the diverse tradition of jazz. An entirely new and distinctive sound characterizes this unique project, put together by drummer, composer, arranger, producer, and bandleader Clemens Grassmann. Enlisting a capable crew of musicians including David Milazzo (alto sax), Alex Madeline (tenor sax), Jernej Bervar (guitar), Yoav Eshed (guitar), and Nick Dunston (bass), Clemens’ idea to combine traditional jazz styles with modern sonic approaches has resulted in six songs that take the listener on a journey through classic blues traditions of the very early 20th century, when field-hollers and street-callers were engaged in call and response, and marching bands filled the streets with spirited music. 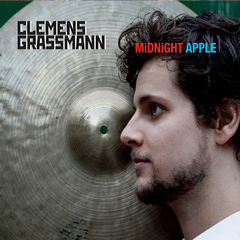 Ahmad Jamal's “Poinciana” may be one of the most intriguing pieces of music that inspired Clemens Grassmann to compose Midnight Apple, combining the aforementioned traditional sounds with modern blues and rock guitars, developing decades-old musical traditions into a bold new style that fits smoothly within the context of a modern jazz fusion band. The call and response tradition is prominent throughout the recording and reappears as the music progresses from section to section - two saxophones duel with two guitars, resulting in a passionate and engaging musical exchange. With new technologies come new horizons, and as humanity is reaching out to explore space and time, new understandings of nature and the universe shape the zeitgeist of our collective experience. “Sphere” explores a figurative scenario of an ascending space ship departing an earth that is constantly evolving, while plenty of peregrinations remain autochthonous. Our space ship passes through different layers of the atmosphere and as it exits the orbit is affected by neutrino and solar storms, which lead to unexpected twists and resolutions reminding us of the undeniable eternity of it all. As the story of the album unfolds further, the listener is confronted with explosive improvisations and different personalities that are still connected through a common thread. “Mystic” resembles the growth from the root to the groove, from the trunk to the grove and visualizes the influence different cultures have had on the development of music, and more broadly, society. This world will keep on spinning and unveiling its mysterious fruit - enjoy a slice of Midnight Apple and keep dwelling in the sounds of today.